A father and son from Bristol must really be good with words – Cashwords that is. 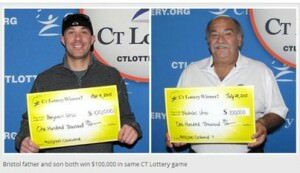 The duo is the first father and son to win the $100,000 Cashword game just four months apart. Ben Urso was the first to win way back in March. This was followed by his father Nick Urso’s win this week. The two lucky winners were just as surprised with their luck and are shown beaming with their respective checks.